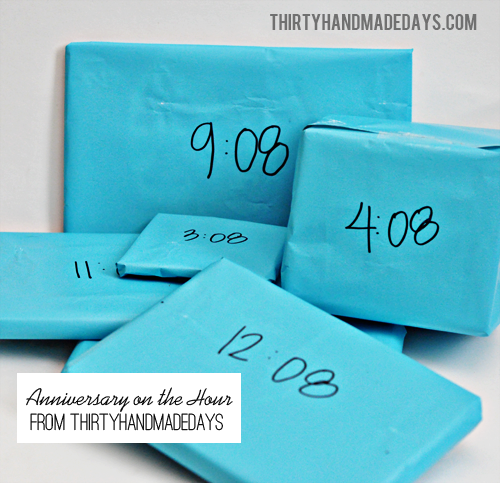 If you’re looking for anniversary gifts, I’ve got some fun ideas for you! Josh and I will celebrate our anniversary in a couple of weeks. Over the years we’ve given several creative gifts to each other. He’s done scavenger hunts, limo rides, getaways and more. He’s the funniest and smartest guy I know but he’s also the most sensitive, romantic and sentimental. I created this idea from another gift I gave him several years ago. The idea is simple: give small gifts for the amount of years you’ve been together. For us, 15 years = 15 gifts. 15 presents seems so tough but really, they are small, simple things that I know he’ll love and/or that remind me of him. For example: playing cards, his favorite sunflower seeds, new socks, etc. 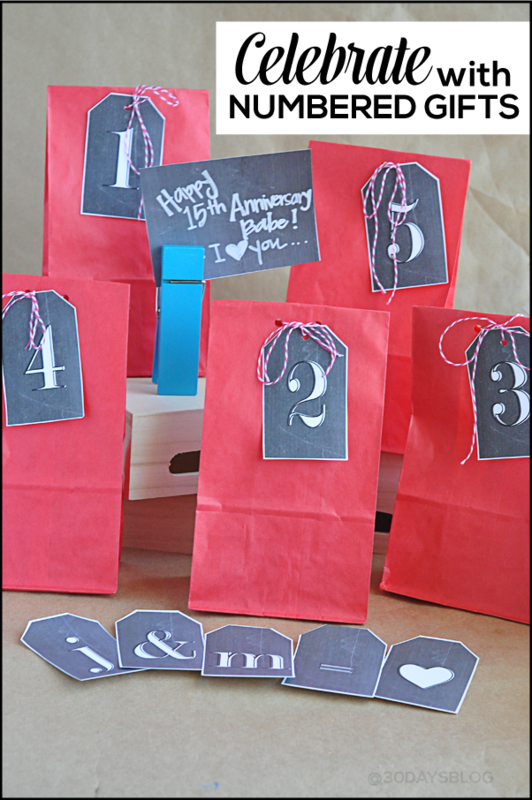 SO- pick out ___ # of gifts, wrap them up and attach some cute chalkboard numbers to them! I created several different tags to be used for all kinds of things. This doesn’t have to be limited to giving gifts for an anniversary- the sky is the limit. Birthdays, a baby shower, used in a banner….pretty much any way you want to use them, go for it! I couldn’t help but add a few little symbols too. And then had fun being a cheeseball and putting some together to make: j & m = love. To see me and Josh as babies (and maybe questionable taste on my wedding dress…. ), check out the anniversary idea that inspired this post. Download whatever tag you’d like below. For personal use only. Thanks! Note: These files will open as PDF’s. They are made to fit standard 8.5×11″ paper/cardstock. Check your printers settings to make sure they print correctly. Each one is a little different. Hi! I would love to use the chalkboard numbers but when I try to open them up all I get is a black page. If you could email me the numbers that would be so helpful!! Thank you so much!!! I love your ideas, especially the organizational ones! 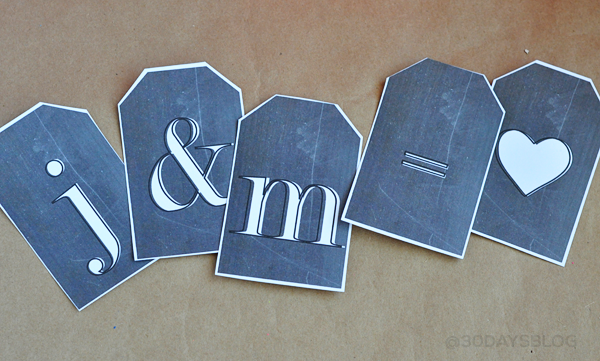 I love these chalkboard tags–thanks so much for sharing them with us. You are very creative–love your ideas, too! thank you so much for this great tags! i´ll use them for our december daily this year! Happy Anniversary! Love the idea but I’d have to come up with 31 gifts!!! 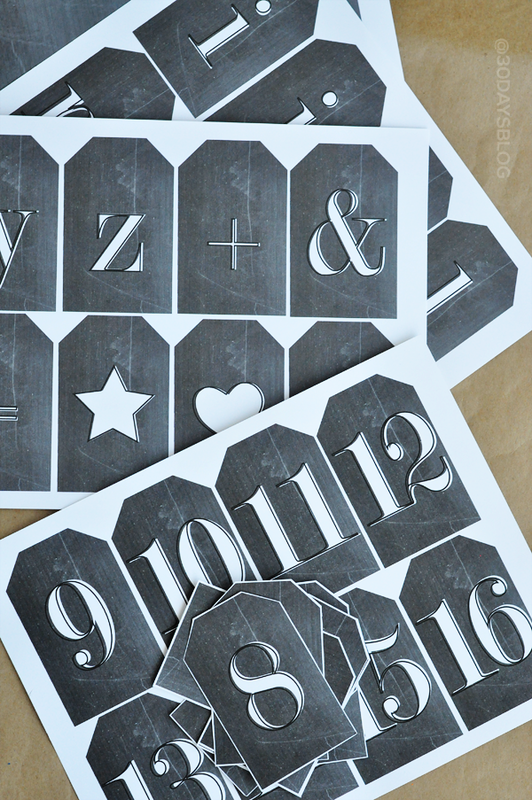 I love the chalkboard craze these days – cute tags! Thanks so much Kristen! I loved putting these together. Happy almost anniversary, Mique! And I love the idea of giving one gift for each year of marriage…or as my parents did for me on my 30th birthday this year, one for each year of life. (Bless them.) The printables you made are AWESOME. Pinning on my gift ideas board! Had fun joining you ladies for the blog hop this round, representing Or So She Says! Happy weekend to you, girl. I love this idea, so thoughtful and fun! I love this! I love chalkboard themed stuff. My hubby & I will be married 19 years in November and it’s hard enough to find ONE gift let alone 19! :P Maybe I’ll do it for my kiddos birthdays. ;) And thank you for the free printables! I love the idea for your kids birthdays- I bet they would LOVE it! You’re welcome for the printables! How fun are you? My husband would love this on our anniversary! I have until April to come up with 18 presents! Thanks for the fabulous idea! You and Jen are the same! (18 yrs) How fun. Josh loves things like this so I’m excited to give it to him. I love this idea!! I have a month to come up with 18 gifts… YIKES! :) gonna be super fun though! I know, this idea would be hard to execute if you’ve been together for a looong time…..the longer we’re together, the more gifts. Hope you do it and that your man loves it Jen! Thanks, Mique! Our anniversary is in November, perfect timing to get my act together ;). We usually default to dinner, but this will be a fun added twist. Thanks for sharing your creativity and talents! Have a great weekend! You’re welcome Kim! Plenty of time to put it together for November. Thanks for the sweet comment!